Switch back and forth between reading the Kindle book and listening to the Audible narration. Add narration for a reduced price of $8.49 after you buy the Kindle book. 5.0 out of 5 starsThis re-imaginated story of The Little Mermaid was absolutely magical and enticing. 4.0 out of 5 starsFrom meh to awesome! At first, this book felt boring and predictable. I wasn't really enjoying it, it was just kinda eh. It also felt predictable at the start. Then it takes a very dark unexpected turn and I ended up really enjoying it! There are so many twists and turns towards the end that you don't see coming. This is also definitely a dark book. If you are having trouble with it in the beginning, just wait. Trust me. 3.0 out of 5 starsGood, but not my favorite retelling. 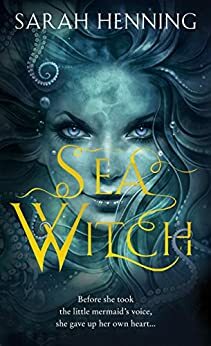 Sea Witch by Sarah Henning is a Little Mermaid retelling—with a twist. When a mermaid washes ashore looking a lot like Evie’s deceased friend, Anna, Evie is beside herself with hope. The mermaid, Annamette, and Evie become fast friends, and Evie quickly makes it her mission to help Annamette keep her legs. Little does she know Annamette has secrets up her sleeve. I was hoping for so much more with this book. This is the third The Little Mermaid retelling I’ve read this year, and the other two blew this one out of the water. Now, it wasn’t all bad, and I did enjoy it, but I was hoping for so much more! The Surface Breaks and To Kill a Kingdom set the bar too high, so I was left feeling disappointed. On the plus side, the book was well-paced and flowed nicely throughout the story. The story concept itself, of course, was a win. I love retellings, and I appreciated the changes the author made to The Sea Witch to make her own. It was a unique story, while still capturing the essence of The Little Mermaid. I also liked that the book included events from the past. This helped shape the timeline and gave me a feel for why events unfolded the way they did. Additional character insight is always a bonus, in my opinion. Now for the negative. While the concept was cool, the story itself felt flat. Yes, it was entertaining, but it was shallow. There was no depth to the storyline, and at times, parts of it felt downright redundant. There was little world building, and I had a hard time imagining the events as they unfolded. Additionally, I was engaged in the book, but not in the characters. I couldn’t connect with any of the characters in the book. While the book provided insight into the characters’ pasts, there wasn’t enough development to force my investment in the characters themselves. Any of them could have lived or died, and I wouldn’t have cared one way or the other. Despite my wishy-washy feelings towards the book, I did like the ending. It was unexpected, and I like the unexpected. However, the very, very ending of the book with the wayward girl felt unnecessary and somewhat confusing. It wasn’t needed, and I’m not sure what the purpose of that scene was. Should you read this book? If you’re a sucker for retellings like me, then of course you should! It wasn’t my favorite retelling, but I’m still glad I read it. Wow, this book is worth all the hype! It's unbelievably good. The world is unique, the magic fresh, and the writing strong. I love that the story takes place in Denmark, the food and culture giving the story extra depth. The ocean plays a huge role in the town, bringing both sustenance and death. Evie was such a sympathetic character. She just wants to do right--by her friends, her family, and herself--but things keep going wrong. Knowing that this was the origin story of the sea witch from Little Mermaid, it was enthralling to read how she eventually meets her downfall. And, oh, that final moment is so torturous! The romance was definitely solid, and I couldn't figure out which prince Evie was really in love with. That being said, I would argue this book is more about the strength of friendship, and it was beautifully done. Can't wait to read what Henning writes next! What sold me on this book was that it was an origin story of the Sea Witch from the Little Mermaid, as well as word of mouth. And I was glad I took the plunge. It only took a few chapters to get me fully invested in this story, with our protagonist, Evelyn, the daughter of a fisherman with royal favor, as well as a witch in secret. Her character and arc are fleshed out and relatable, riding the emotions along with Evelyn. The other characters are well developed as well and stand out in their own way, along with their interactions with each other. I love the setting, which is 19th century Demark, specifically a coastal fishing town, a homage to Hans Christian Andersen. It’s vivid and almost it’s own character at points, along with great world building. The prose is clear and easy to read and I didn’t get lost once, which almost never happens for me. And yet there’s depth and character to it as well, which isn’t easy to do. I can hear Evelyn’s voice while reading. I finished this in a single day, the story was really hard to put down. Even though I knew what was going on in regards to a couple of the twists, it was gripping to see how things develop, and through the last 100 pages, I kept wondering how things might get worse for Evelyn and her friends every other page. And yes, the story gets dark, and it really adds that extra layer that this story needs. This is a must read you cannot miss! I really enjoyed this one. I am a sucker for villains, and especially villain origin stories. As far as disney villains go, Ursula is my favorite. So... this book really had a lot to live up to. And I think it succeeded. The world building was great. I loved all the characters. Nik was my favorite of all. It should come as no surprise that there isn't a happy ending.... this is a villain origin story, as well as the book description itself tells you there is no happy ending. So this is not a spoiler. That said, the plot unfolds pretty predictably throughout the story. But it is done in such a fabulous way, that you're left wanting more! I liked the extra aspects such as Evie and her magic, Tante Hansa, and the hierarchy. And look at that cover! Instant-lust. I will definitely be on the lookout for more books by Sarah Henning.